Making clay sculptures is what Judy Richards loves doing! Judy Richards' clay sculptures are a wonderful, light hearted look at the human form. Her fascination with human figure drawing leads her to examine the romance of the circus through the grace and agility of acrobatic performance. The voluptuous curves of the heroines of her other stories hint at a sensuality, while their smiles beguile with innocent charm. Starting with quick pencil sketches drawn from a life model, Judy examines her subject from all angles - after all, the end result will be a three dimensional artwork, viewed from all directions. 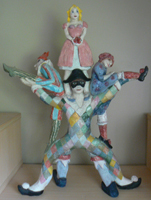 The sculpture on the left is typical of Judy's sculptures involving circus entertainers, one of her absorbing interests. The bronze on the right was made using the "lost wax" method and cast by Judy herself, with help from husband, Ben. These stories (or personal myths?) on ceramic plaques, below, which hang in the shade-house attached to Judy's home, have a naivety and freshness, which is very appealing. Always interested in figurative drawing or sculpture, Judy says of her fascination with clay that it is "messy, tactile, satisfying" and that, after all, "play is the child's work". As a former teacher of very young children, she would know! The faces on the right are from clay sculptures from Judy's "Artists' Women" series, which examined the contributing role of wives and lovers in the artistic success of their more famous, male, artist partners. 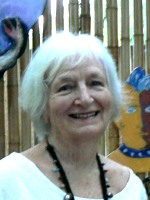 Judy's group exhibition work also reflects her joy and exuberance as she makes light-hearted but perceptive observations about the role of members of the Low Isles Protection Society, who care for the small tropical island near Port Douglas. With a group of local artists, Judy visited the island on several occasions, also joining others in their blue 'stinger suits', which give some protection from the marine stingers, which abound in warm tropical waters in the 'Wet' season.